Let’s get one thing out of the way. I don’t really have a Thanksgiving decor plan that varies from my Christmas one. 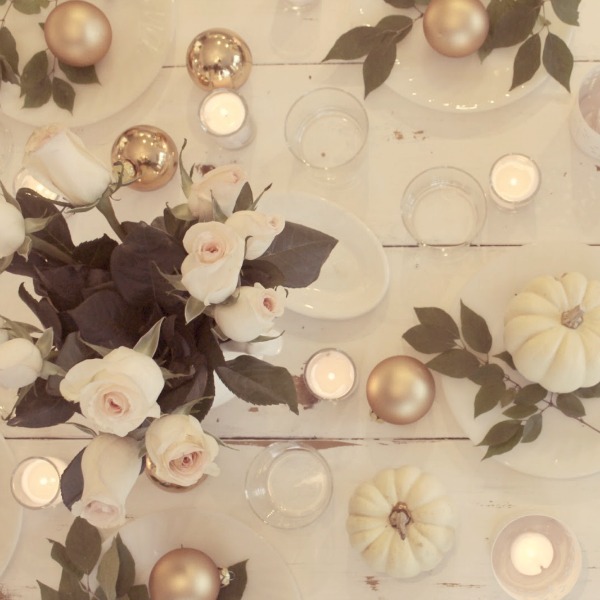 Orange has never been my thing, and since I typically start decorating for Christmas on turkey day…let there be white and light for My Tranquil and Hushed Thanksgiving Mood this year and every year. Tranquil and Hushed Thanksgiving Mood. Hello Lovely Studio. 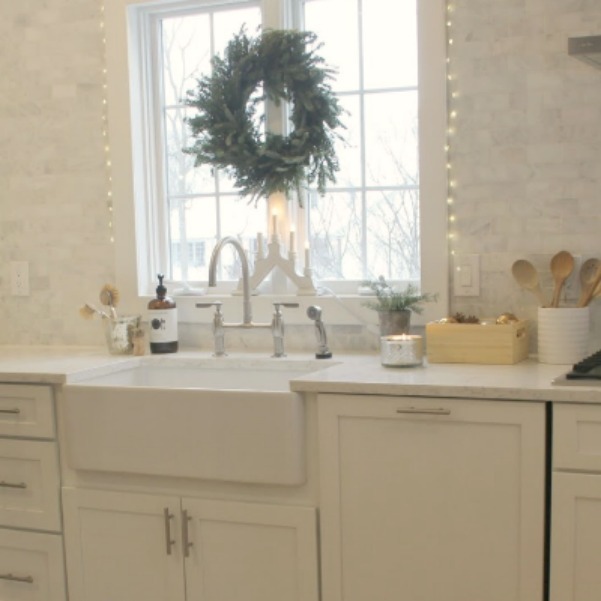 Neutral holiday decor and white Christmas decorating featuring a mix of vintage, new, and handmade. This time last year, I was in the summer-like Southwest in flipflops for Thanksgiving, where shocking pink bougainvillea climbed a trellis just outside my bedroom window! Since we sold our Arizona vacation house, this year, we are staying at home in Northern Illinois where the courtyard wall and outdoor table are still frosted with snow. As I mentioned the other day, we are opting for a very laid back Thanksgiving with no hosting and no traveling to family. Instead, we will have a simple dinner and make roasted turkey sandwiches to deliver (with other essentials like socks, wipes, etc.) to folks locally who are homeless. We’ll also deliver sandwiches to folks who may have to work on the holiday. Affiliate links follow and won’t cost you extra yet may earn this blog a small commission. 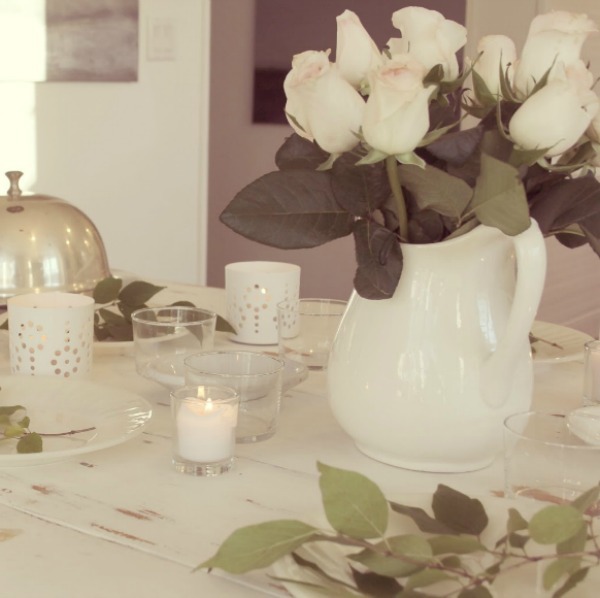 A simple rustic tablescape in the kitchen. Glassware: FIND IT HERE. Gold Christmas ornaments: FIND THEM HERE. 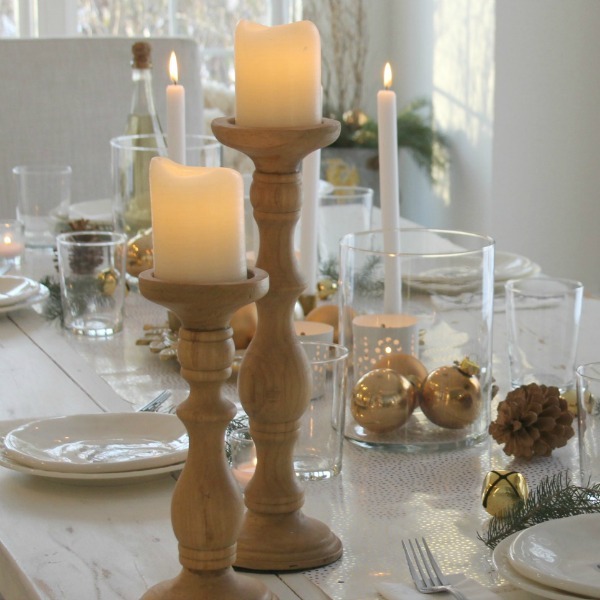 Candlelight and humble ingredients converge upon a hushed farm table. 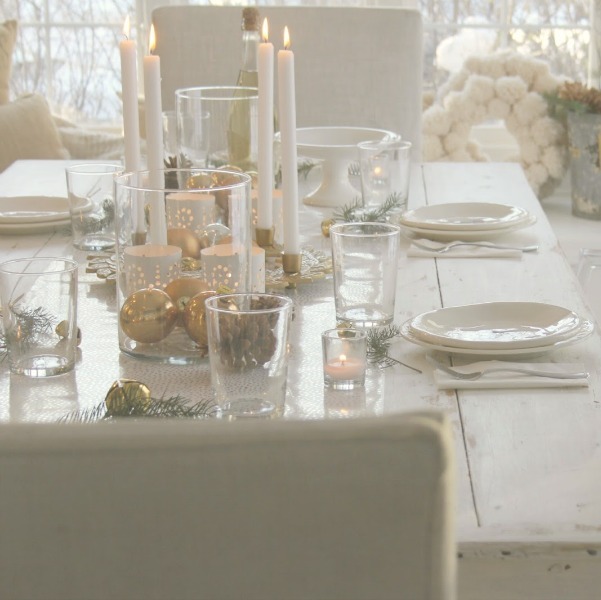 This year, our Thanksgiving table will be hushed, serene, and inspired by a French Nordic aesthetic. 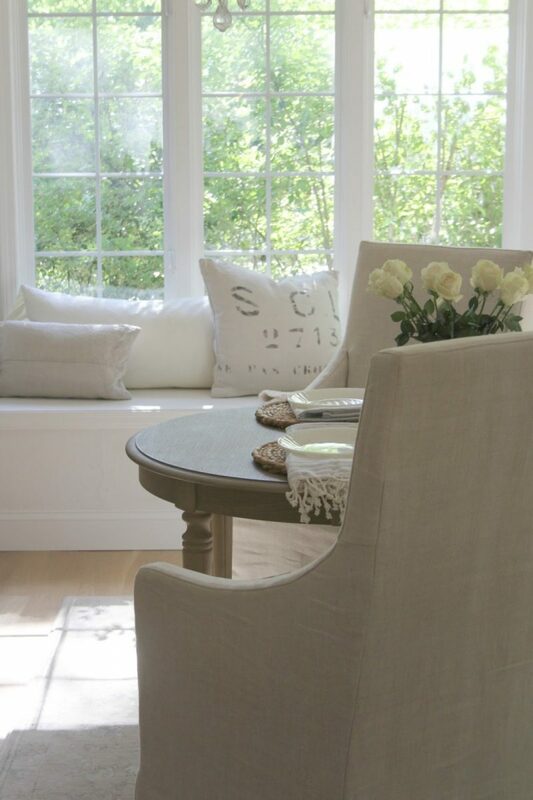 When you want to encourage peaceful loving exchanges and intimacy, one way to nurture the mood is with soft decor elements. Gold Christmas ornaments: FIND THEM HERE. 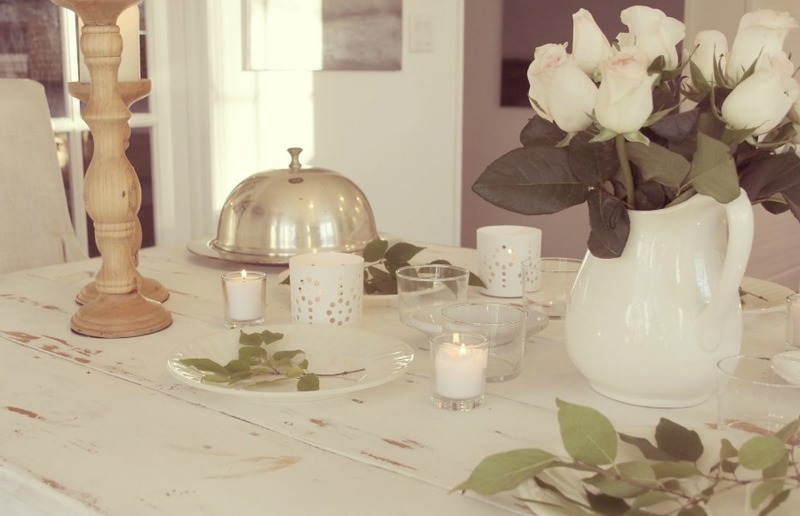 A simple rustic tablescape in the kitchen. Glassware: FIND IT HERE. White or Blush Pink Roses. I can’t help it. 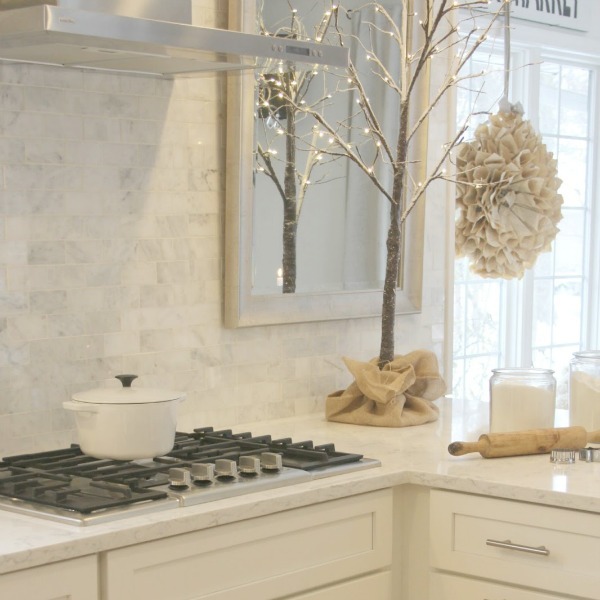 White on white decor feels natural to me in any season! 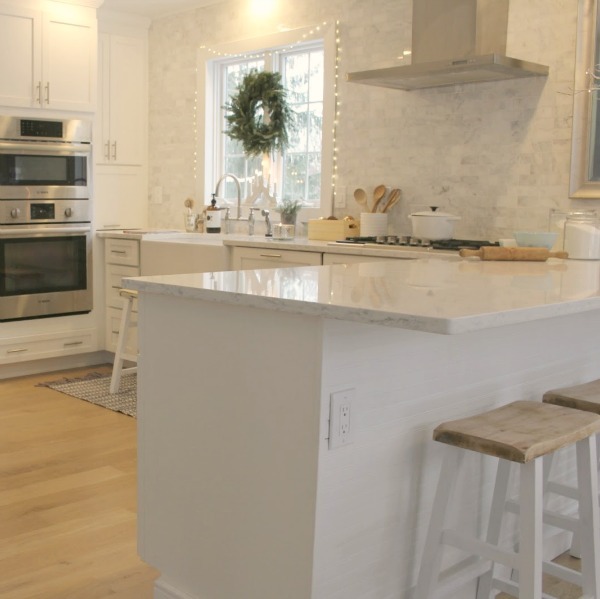 Are you expecting a crowd this Thanksgiving? Lucky you! 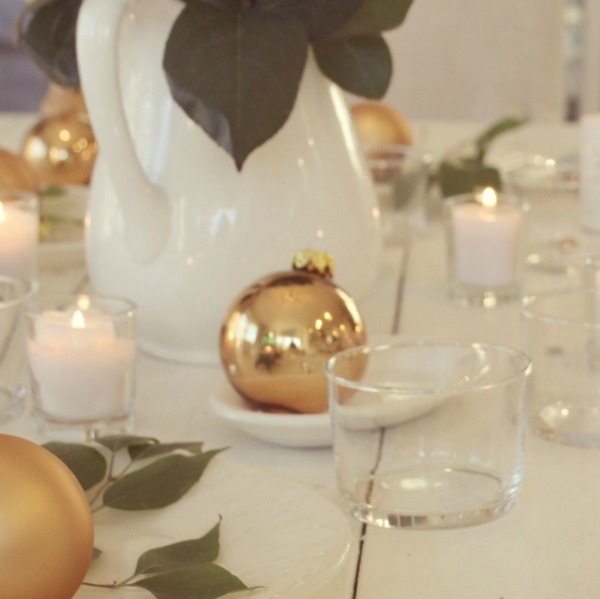 Gold Christmas ornaments: FIND THEM HERE. Child-like Gratitude and A Sense of Wonder. 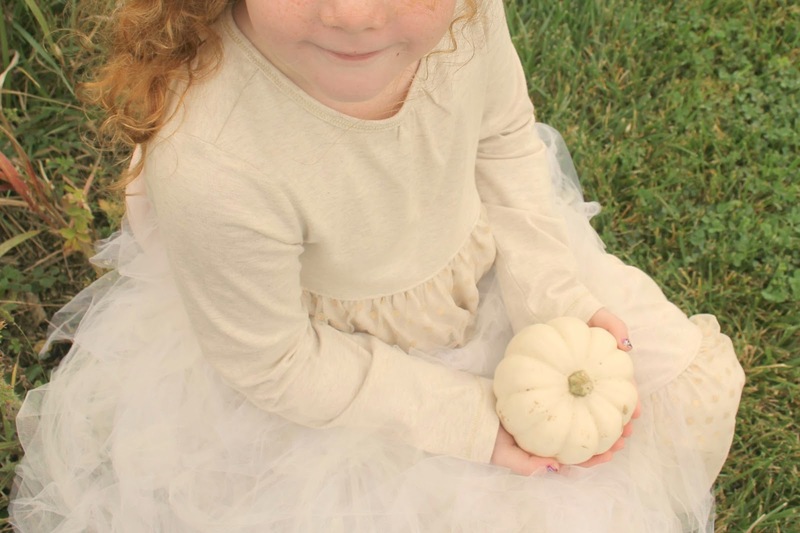 This sweet girl in tulle I photographed is at an age when pilgrims landing at Plymouth, petite pumpkins, and pretty leaves dancing in the air is still magical…such childhood wonder can always be awakened in your heart and mine. Hello Lovely Studio. 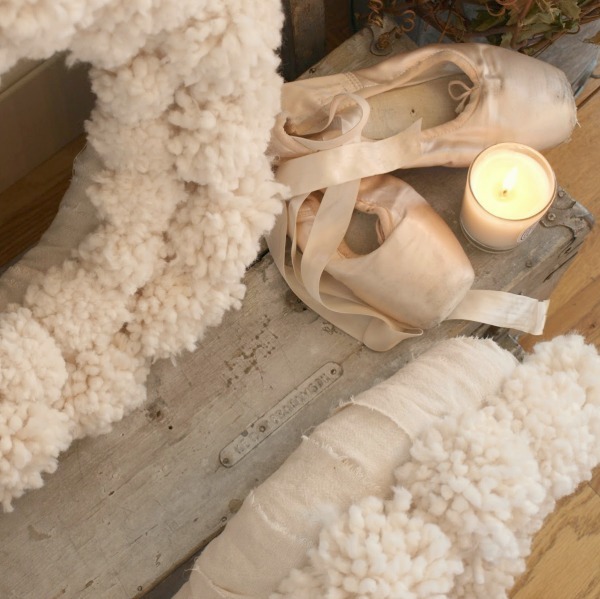 Dead pointe shoes from my collection. 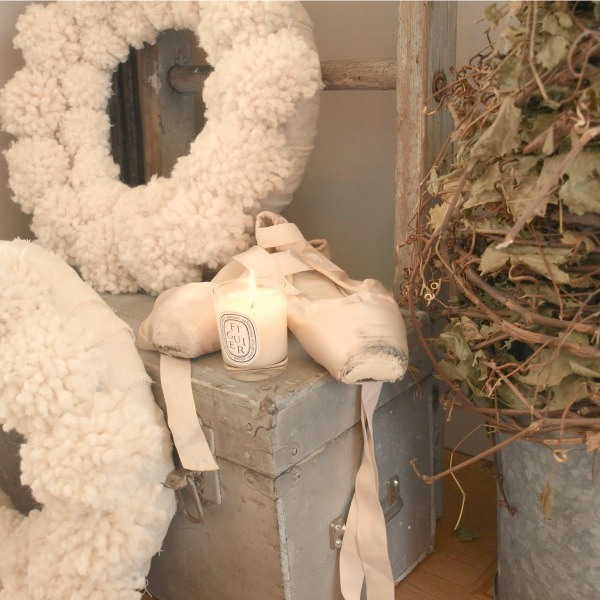 Diptyque Figuier candle: FIND HERE. Here is a prayer I wrote a couple Novembers ago, and it remains relevant. 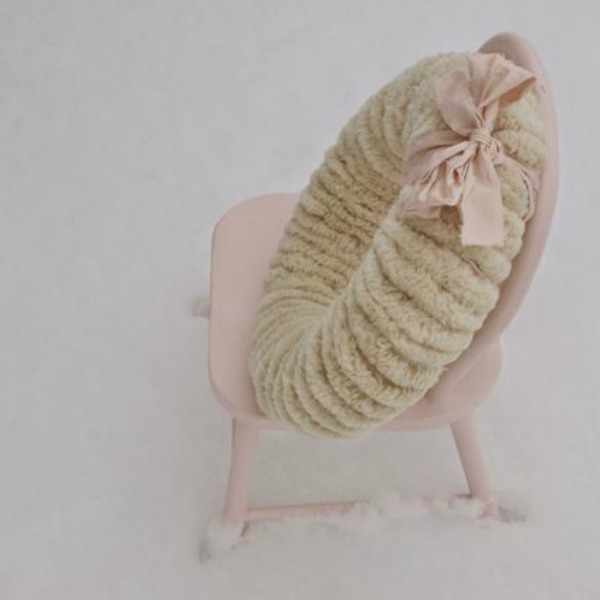 My passion for pom pom making endures! 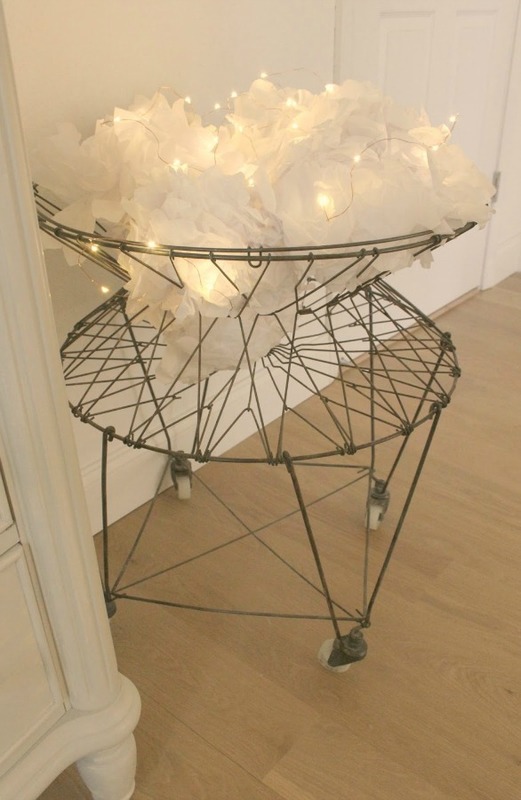 If I am not forming poufs from tissue paper (why, yes, white tissue! 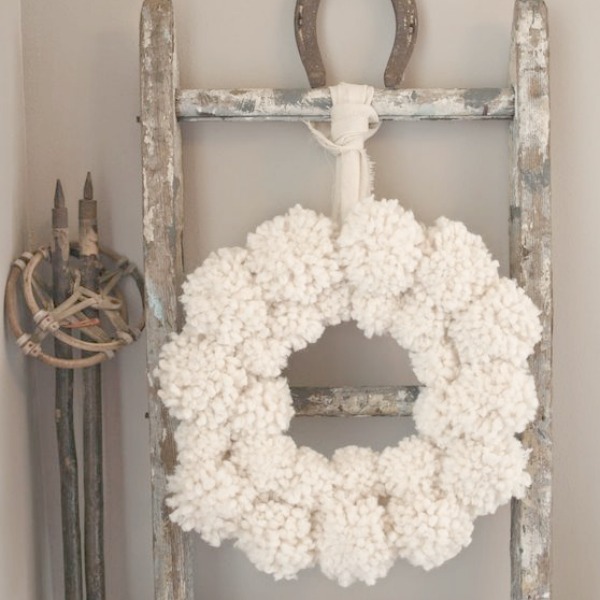 ), then my 70’s flowerchild self is making wooly pom poms from wool yarn the old fashioned way. We’re fortunate to be able to forage right outside our door for greenery and branches which look so festive with neutral and white decor. 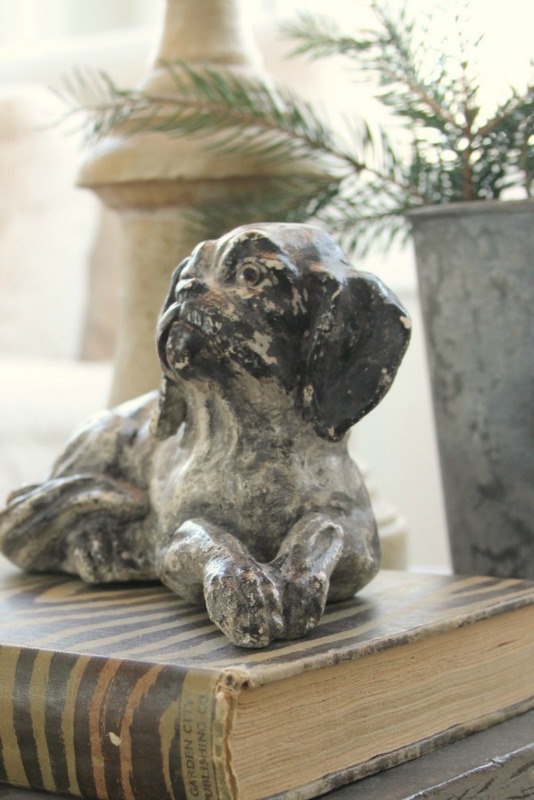 I brought this chalkware pooch home with me from Paris where I found him at a vide grenier. 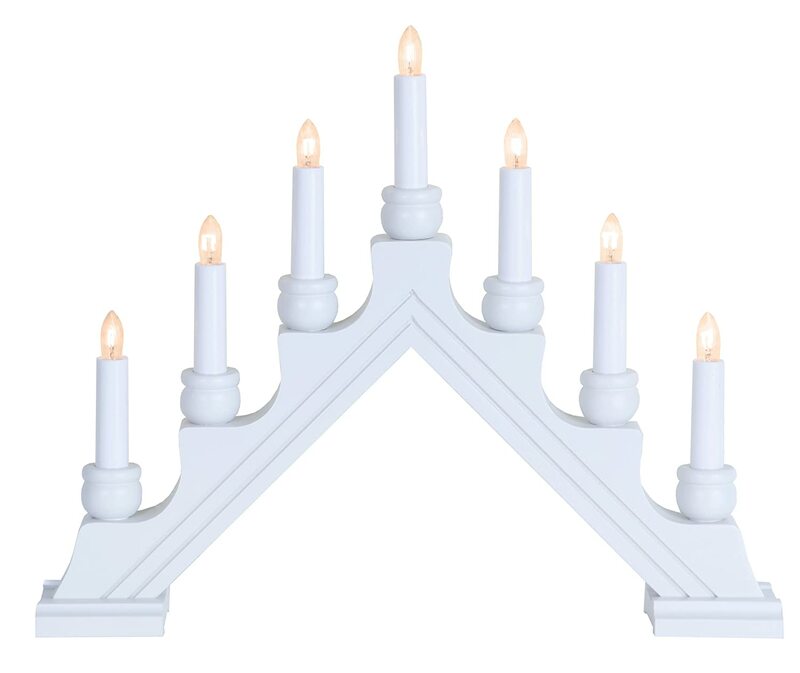 White wooden Swedish electric candelabra: FIND HERE. 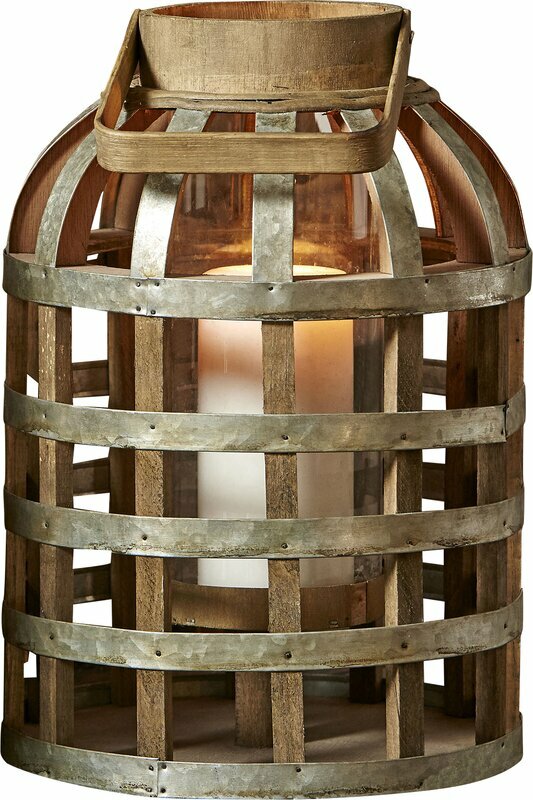 For me, I don’t ever want to take ‘rustic’ too far. I love weathered textures, peely paint, tarnished metals, etc. but I need a good dose of clean, airy white mixed in there as well. 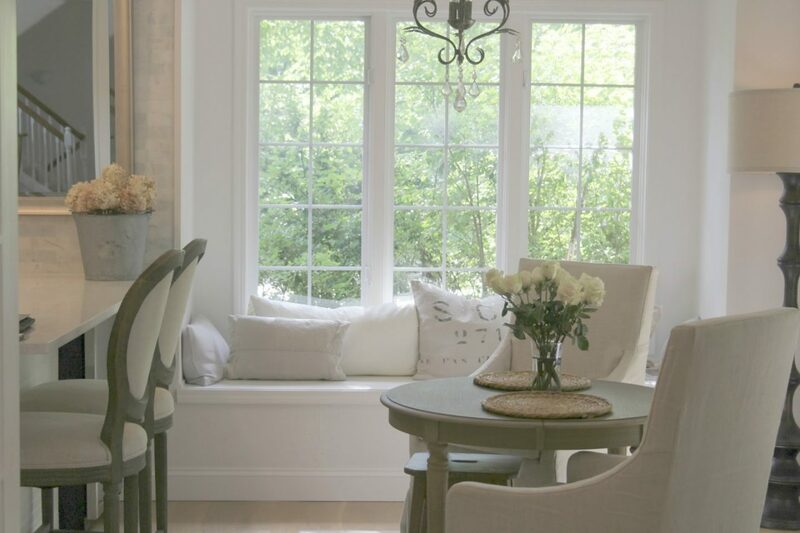 You can see my vintage galvanized pail on the window seat below. On its own without the soft greenery, it would look plain grimy and ridiculous. 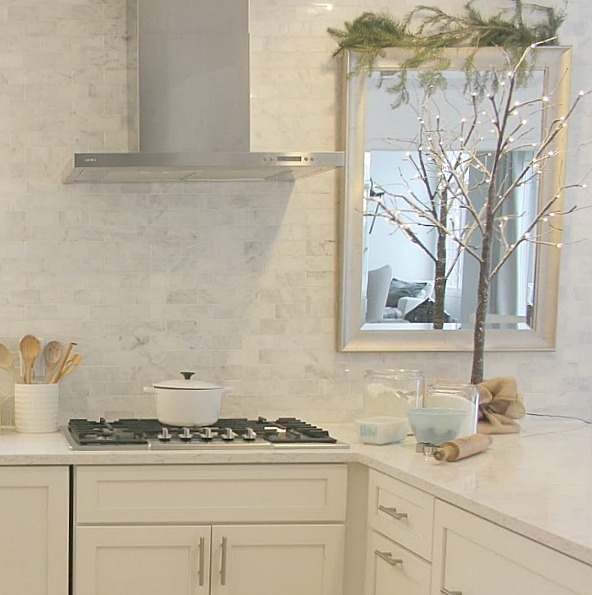 No formulas here – just a gathering of simple, rustic elements that work together. 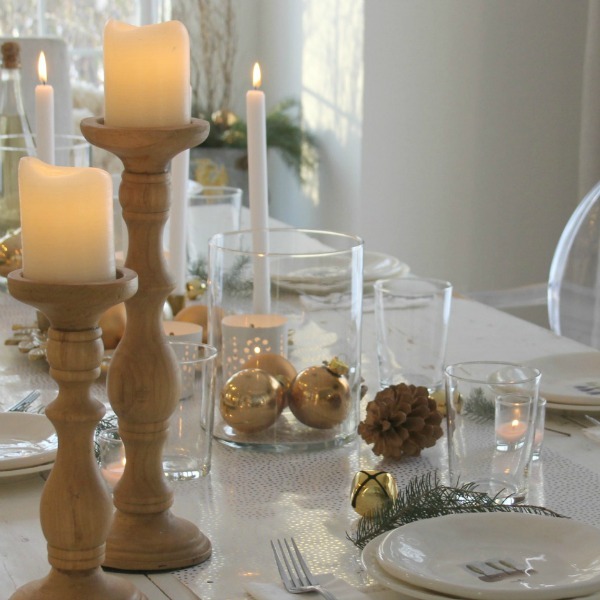 Find rustic candlesticks RIGHT HERE. 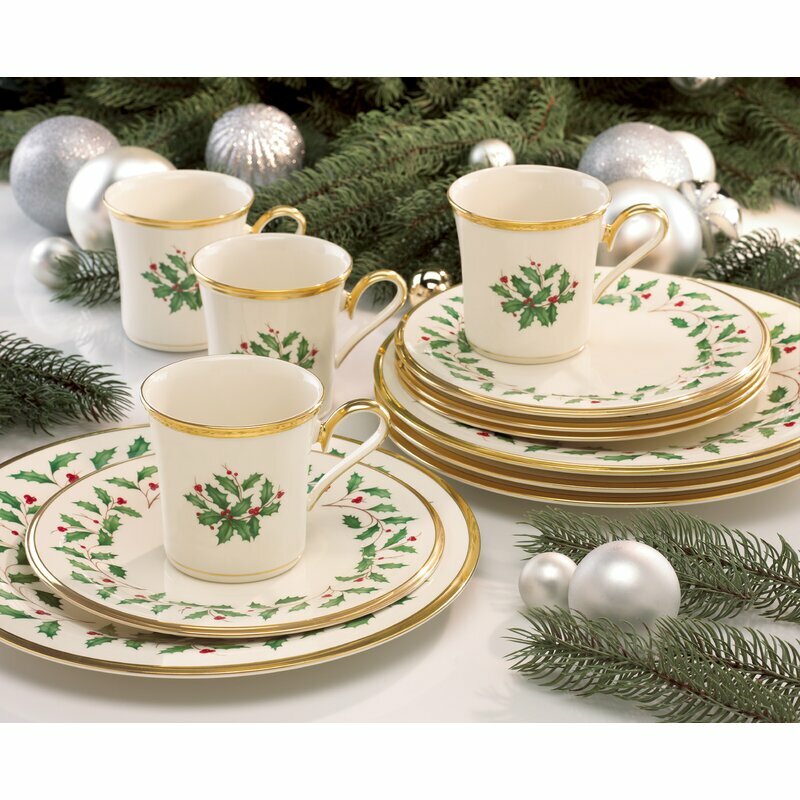 Lenox Holiday Dinnerware, Service for 4. I love how the vintage pages of my paper wreath (below) also add great texture but still whisper. Wintry Branches Kissed With Snow. Inside and out, this time of year the trees are bare and if we’re lucky, iced with lovely white snow. So why not bring that look inside? 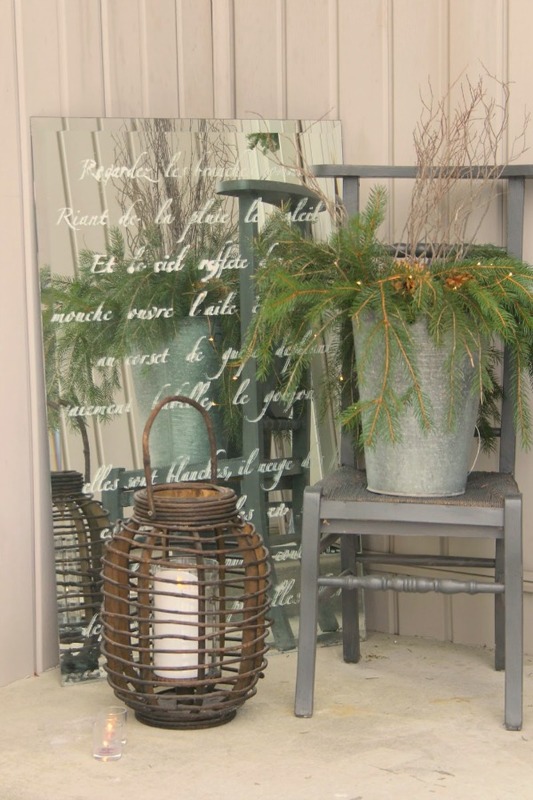 It can be as simple as plopping a bare wintry branch in a clear glass vase. They impart a gorgeous, natural silhouette and look beautiful for an extended period of time. 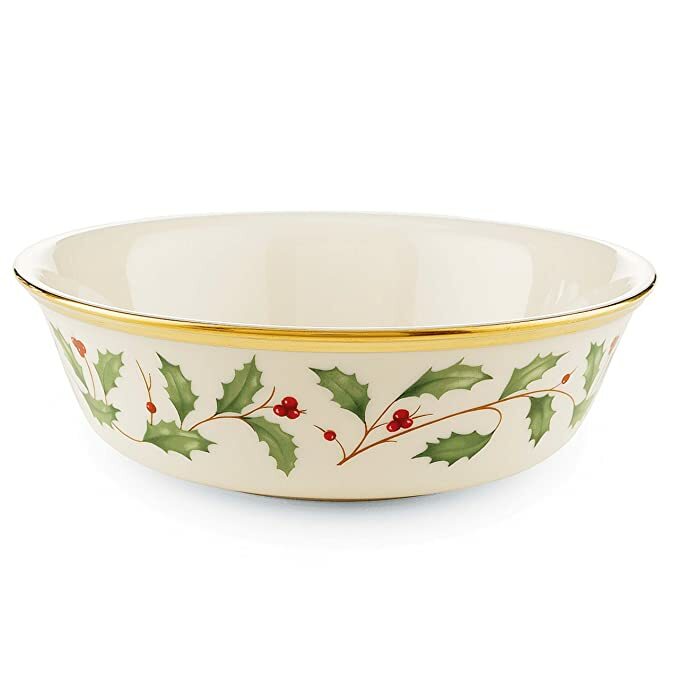 I love vintage mixing bowls and bakeware – this Amish butterprint pattern is one I grew up. Dutch oven: FIND HERE. 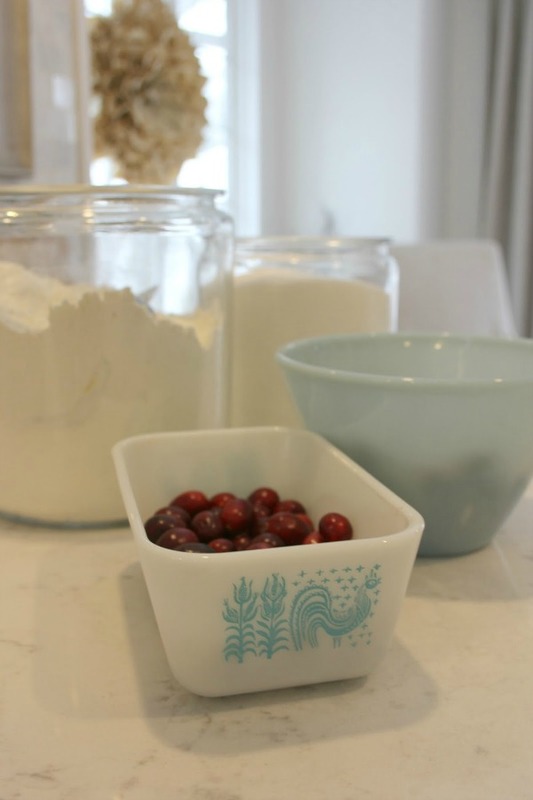 Even my favorite vintage kitchenware is hushed blue and white! The holidays for me are about baking deliciousness, and I am excited to begin baking my famous Christmas cookies, gingerbread, and family favorites including cinnamon bread. Hello Lovely Studio. 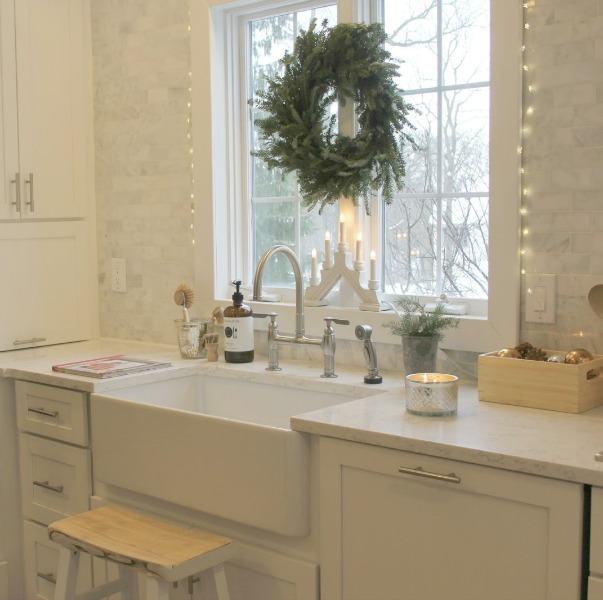 Fireclay Farm sinks: FIND HERE. Capri Blue candle in mercury glass: FIND HERE. They make everything prettier and magical. Time for this fairy to get cooking! Thank you, friends, for visiting me each day and journeying together. I am so thankful for all the ways this blog has shrunk the world, and I marvel at the friendships possible when hearts connect. Please drop me a line and let me know what you are up to this Thanksgiving – even if you think it’s completely boring or if you’re struggling. I would love a chance to encourage you and pray if there are needs you care to express. 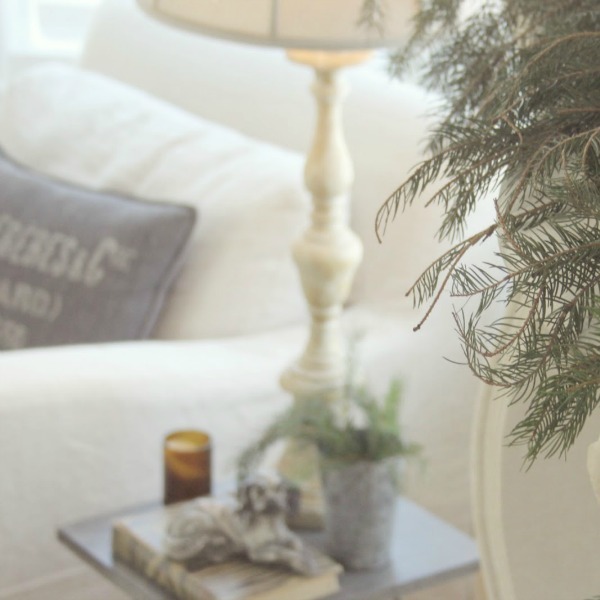 Next Post Christmas Quotes & Favorite Black Friday Gift Ideas! Spending thanksgiving in Napa with my daughters and family. Wishing you a peaceful and tranquil day. I have shared your words “peace to you right where you are” so many times. Hope you don’t mind. as I love the meaningful thought. I am all for your simple tranquil decor ideas. 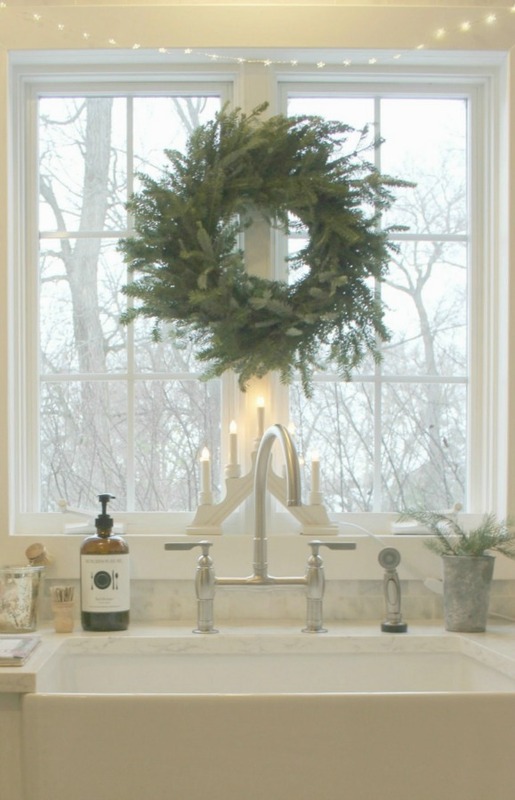 Look forward to more holiday inspiration.